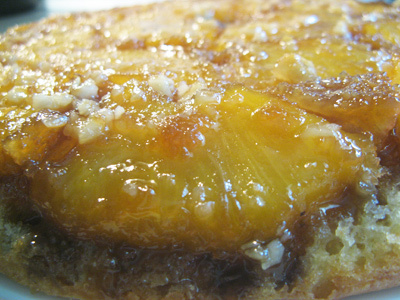 I haven’t had a slice of pineapple upside down cake in years but recently in Hawaii I had the chance to have a taste again with sweet Hawaiian pineapple, rum and macadamia nuts. It was fantastic and I wanted to find a recipe that combine all those wonderful ingredients. 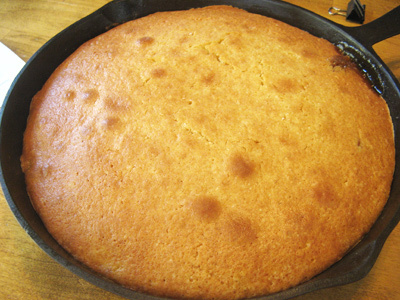 This cake was so easy to make and baked in a cast iron skillet which worked out perfectly. When the cake had cooled and it was time to flip the cake onto the plate I was a bit nervous. 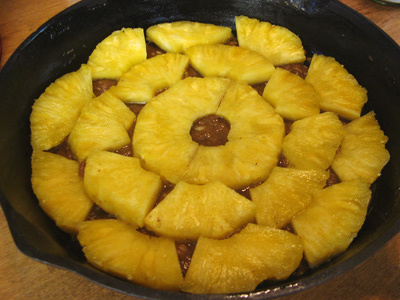 Would the pineapple stick to the bottom of the skillet? Would the cake fall apart? How would it taste? I was ecstatic when I turned it over and it looked this good. And it tasted just as good! 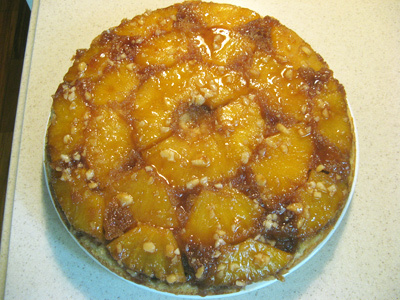 The topping of the cake consists of pineapple slices, butter, dark brown sugar, and macadamia nuts. 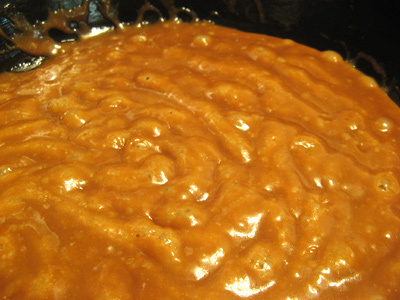 To make the caramel sauce, melt 3/4 stick of unsalted butter in a 10 inch cast iron skillet. Measure out 3/4 cup dark brown sugar and chop 1/4 cup macadamia nuts. 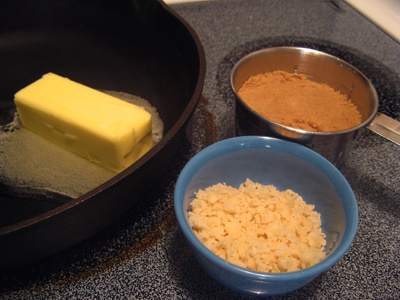 When the butter has melted, add the dark brown sugar and stir to make a caramel sauce. Constantly stir over medium low heat for 4 minutes. 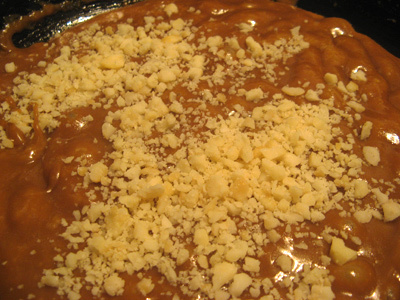 The last 30 seconds add the chopped macadamia nuts to the caramel sauce. Once your 4 minutes is up take the skillet off the hot burner. Cut pineapple into 3/8 inch slices and core. Arrange your pineapple slices with one slice in the middle. Add smaller pieces radiating out from the middle to form two larger circles. Set aside while making the cake batter. 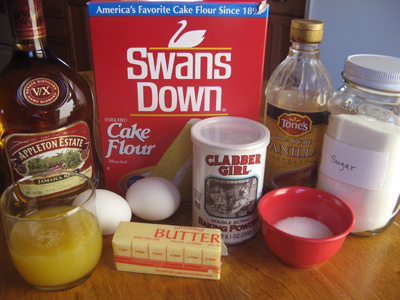 Cake ingredients include cake flour, baking powder, salt, unsalted butter, sugar, eggs, vanilla, rum, and pineapple juice. 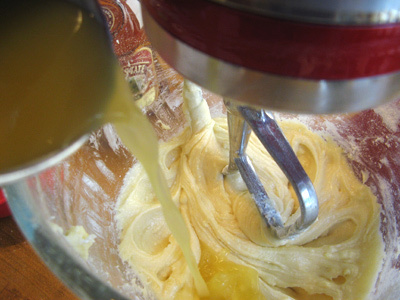 Beat softened butter and sugar together with a mixer until light and fluffy. 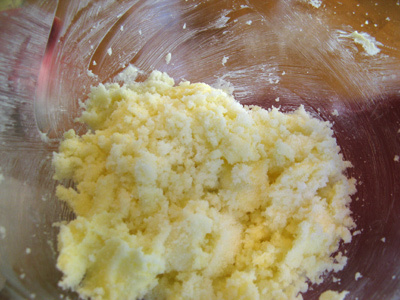 Sift together your cake flour, baking powder and salt. 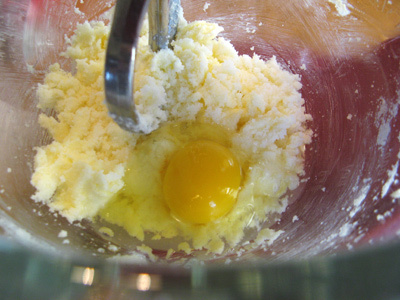 Add about half the flour mix to the bowl and blend well, scraping the sides of the bowl. Beat in the remaining flour mix just until blended. 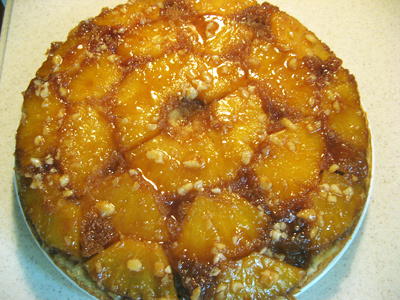 Spread batter evenly over the pineapple topping. Bake cake 350 degrees in the middle of oven 30 – 40 minutes. Cake should be browned on top. Insert a toothpick to test it. 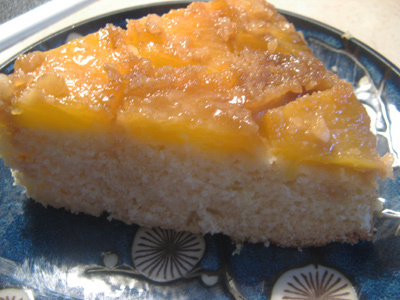 When done let cake rest for 5 minutes, then place a plate over the skillet and invert cake onto plate. Sprinkle 2 tablespoons rum over the top of cake. It tastes really good when warm. Cut pineapple slices 3/8 inch thick and core. Melt 3/4 stick unsalted butter in 10 inch cast iron skillet. 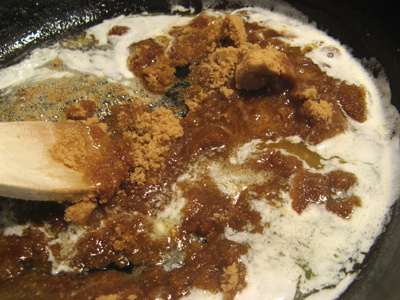 Add brown sugar and simmer over medium low heat, stirring 4 minutes. About 3 1/2 minutes in, add the macadamia nut pieces. Stir for 30 seconds then remove skillet from heat. Arrange pineapple slices with one slice in the middle. Add smaller pieces radiating out from the middle to form two larger circles. Set aside. Sift together flour, baking powder and salt. Set aside. 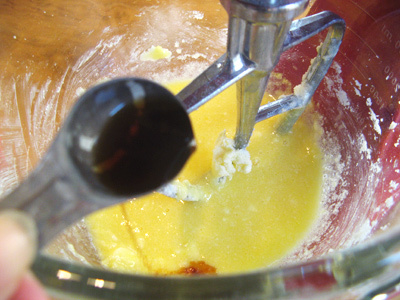 Beat softened butter and sugar with a mixer until light and fluffy. Add eggs, one at a time, beating after each egg. Add vanilla and rum to the mix. 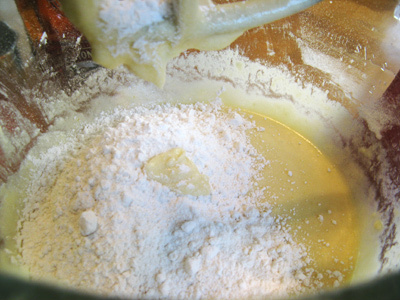 Add half of the flour mixture and beat on low just until blended, scraping the sides of the bowl. 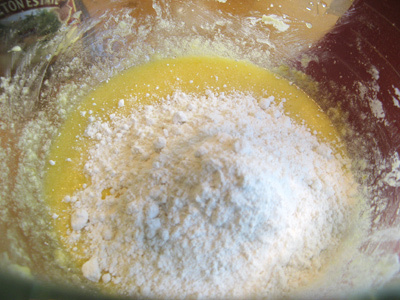 Add pineapple juice and blend, then add remaining flour mixture beating just until blended. 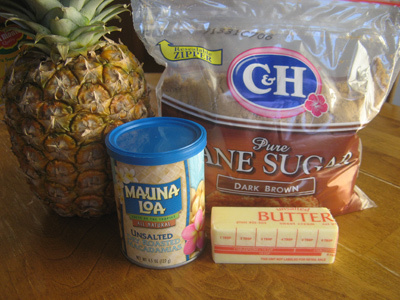 Spread cake batter evenly over pineapple topping. Bake cake in middle of oven for 30 – 40 minutes. Test cake with a toothpick and when done let cake cool for 5 minutes. 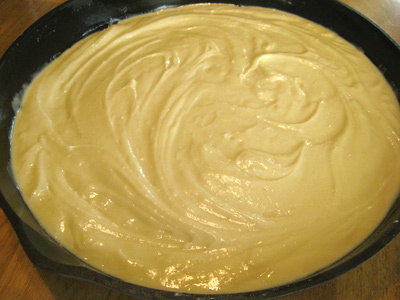 Place a plate over the skillet and turn over to invert cake onto plate. Sprinkle remaining 2 tablespoons rum over cake and let cool.